This Copper Roof Birdhouse features 8 separate rooms with perches and a roof in the shape of a bell. 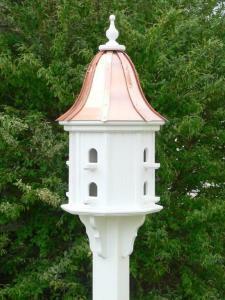 Copper Roof Gazebo Birdhouse is constructed to lift up roof for easy cleaning. Complete with Vinyl 4 inch sleeve and attached decorative brackets - fits on a 4 x 4 post. Available also with Patina Copper Roof and Cypress Shingle Roof.